For the past few months, my husband and I have been packing up the house in preparation for an upgrade. 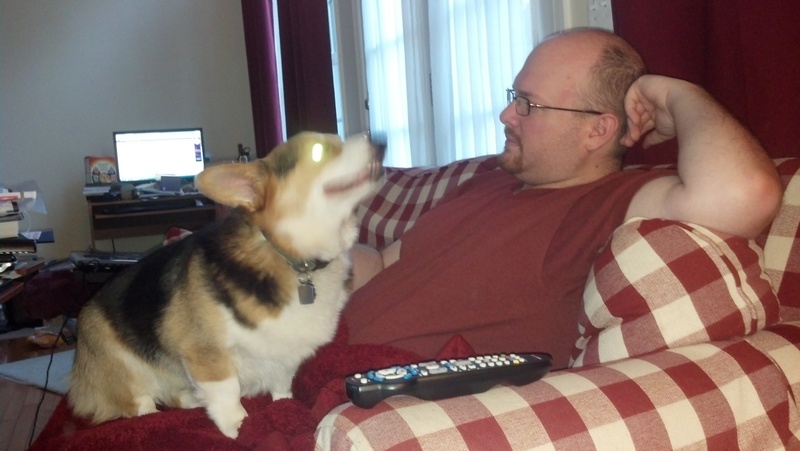 Moving day is approaching, and–well–the corgis have started to notice. It started the day I packed up six boxes of kitchenware. I stacked these near the kitchen table, and Yoda knew something was up immediately. When I came back from work, he ran to his crate and looked at me with that “Lassie” look–letting me know he had something to tell me. Well–his crate had all kinds of puke in it (I will spare you a picture). The fact that he threw up in his crate told me just how upset he is about the house being packed up–he goes into his crate (which I leave open for him during the day) when he is afraid or tired. And he has thrown up for less upsetting things before (did I mention Yoda is afraid of everything?). Since then, Leia has been overjoyed, hiding behind boxes and finding new and exciting sleeping nooks. Leia finding a cozy sleeping nook among the boxes. Yoda has been more hesitant. He’s been following me everywhere, and he’s even being clingy with “his friend,” as I call my husband to him. Normally, he is hesitant with my husband, but as the picture below demonstrates, he’s just fine being cuddly (it was such a rare occurrence, I had to snap a poorly-lit picture from my cell phone to capture the moment!). A rare moment–Yoda cuddling with someone other than me! 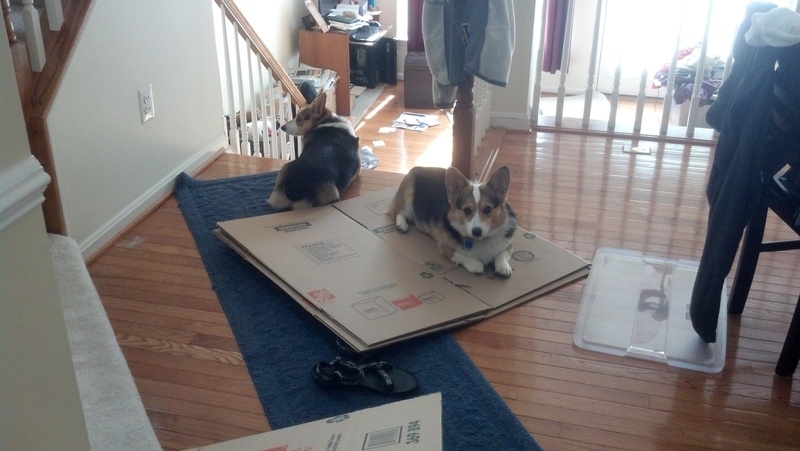 Other than that, my biggest challenge as of now is keeping the corgis from eating all the cardboard boxes. I wonder if other dogs like eating cardboard as much as mine. I try to stop them, of course, but I can’t watch them all the time. I snapped this picture while the corgis were innocently sitting on the cardboard boxes, but the temptation must have been too much. As soon as I returned to the kitchen to pack, they had started pulling off chunks of cardboard to eat! I’ll be back with more updates soon, as I’m sure the challenges of moving with two dogs will continue to present new opportunities to share! 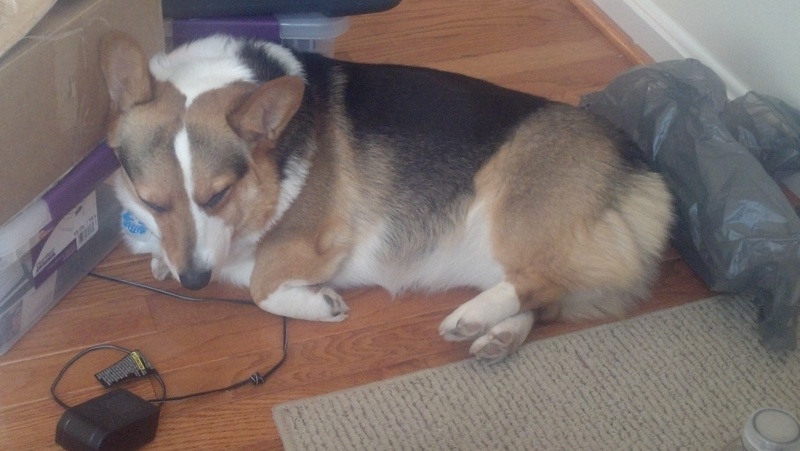 Posted on May 27, 2013, in corgi, inspiration and tagged corgis, moving, training. Bookmark the permalink. Leave a comment.